I remember when I took my first-born baby to the pediatrician for his first checkup 40 years ago. Like most young Moms, I looked up to my pediatrician and completely trusted him. I did everything he told me to do, never questioning his expertise or doubting him, believing that he would never recommend or do anything that would put my baby in harm’s way. Parents had no information at all about vaccine risks and failures. We just followed the doctor’s orders. Pediatricians’ offices have become ugly battlegrounds. Intelligent, well-informed and loving parents asking legitimate questions about vaccination are being belittled and treated with disrespect and contempt by too many pediatricians robotically implementing the CDC’s inflexible vaccine schedule in clear violation of the informed consent principle. Don’t take my word for it, go to NVIC’s Cry for Vaccine Freedom Wall and read report after report of just how terrifying pediatric check-ups have become. The sacred trust between mothers and pediatricians fostered by mutual respect and shared decision-making has been broken. Sadly, the admiration and trust that mothers used to have for family pediatricians is melting away and being replaced by fear. It will be done if we believe it can be done. It is time to let our elected representatives know that we want them to put legal boundaries on the authority that doctors and public health officials wield in our society. Read the full article at NVIC.org. 1 CDC. 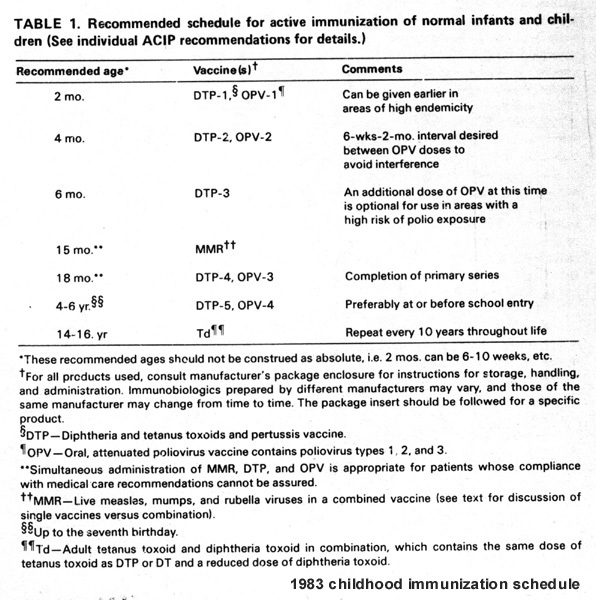 Recommended schedule for active immunization of normal infants and children 1983. 2 U.S. Centers for Disease Control and Prevention (CDC). Recommended Immunization Schedules for Persons Aged 0 Through 18 Years, United States, 2018. 3 Kempe A, O’Leary S et al. Physician Response to Parental Requests to Spread Out the Recommended Vaccine Schedule. Pediatrics 2015; 135(4). 4 Radcliffe S. Not in My Office: Pediatricians Debate Treating Unvaccinated Kids. Healthline Feb. 5, 2015. 5 Thompson D. More parents believe vaccines are unnecessary. Health Day Aug. 29, 2016. 6 American Academy of Pediatrics. Medical Versus Nonmedical Exemptions for Child Care and School Attendance. Pediatrics August 2016. 7 Edwards K, Hackell JM. Countering Vaccine Hesitancy. Pediatrics 2016; 138(3). 8 Nelson R. New AAP Policy on Patient Dismissal for Vaccine Refusal May “Erode Solidarity” Among Pediatricians. Infectious Disease Advisor May 24, 2018. 9 Radcliffe S. Not in My Office: Pediatricians Debate Treating Unvaccinated Kids. Healthline Feb. 5, 2015. 11 National Vaccine Information Center. 50 Doses of 14 Vaccines Before Age Six? 12 Fisher BL. Is the Childhood Vaccine Schedule Safe? National Vaccine Information Center Oct. 1, 2017. 13 Institute of Medicine Committee on the Assessment of Studies of Health Outcomes Related to the Recommended Childhood Immunization Schedule. Summary: Health Outcomes (p. 5-6) and Conclusions About Scientific Findings (p. 11) and Review of Scientific Findings (p. 75-98). The Childhood Immunization Schedule and Safety Stakeholder Concerns, Scientific Evidence and Future Studies; Washington, D.C. The National Academies Press 2013. 14 NVIC. National Vaccine Information Center Supports Three of Five Recommendations of New IOM Report on U.S. Childhood Immunization Schedule Safety and Calls for Transparency. Business Wire Jan. 16, 2013. 15 CDC. Recommendations and Guidelines of the Advisory Committee on Immunization Practices (ACIP): Contraindications and Precautions. Table 4-2. Conditions incorrectly perceived as contraindications or precautions to vaccination (i.e., vaccines may be given under these conditions). Sept. 14, 2018. 16 CDC. Febrile Seizures Following Childhood Vaccinations, Including Influenza Vaccination. Nov. 2, 2017. 17 Fisher BL. Blackmail and the Medical Vaccine Exemption. National Vaccine Information Center May 18, 2018. 18 Fisher BL. Do You Know How to Recognize a Vaccine Reaction? National Vaccine Information Center Aug. 27, 2018. 19 Berezow A. Jail ‘anti-vax” parents . USA Today Jan. 28, 2015. 20 Mathews J. Unvaccinated Families Addresses Should Be Made Public. Time Magazine Feb. 13, 2015. 21 Danziger PD, Diamond R. The Vaccination Double Standard. Slate July 25, 2016. 22 Fentiman LC. When it comes to vaccines, rich parents get away with child neglect. Washington Post May 10, 2017. 23 Fisher BL. Class and Race Profiling in the Vaccine Culture War. National Vaccine Information Center July 17, 2017. 24 Caceres M. Professor Says Parents Have No Right to Refuse Vaccines for Their Children. The Vaccine Reaction Oct. 31, 2018. 25 Fisher BL. Guide to Reforming Vaccine Policy and Law. National Vaccine Information Center 2017. 26 Fisher BL. The Moral Right to Conscientious, Philosophical and Personal Belief Exemption to Vaccination. National Vaccine Advisory Committee May 2, 1997. 27 Fisher BL. Why is Informed Consent to Vaccination a Human Right? National Vaccine Information CenterJune 28, 2018.